Healthy eating is much more fun when it’s presented in a Bentgo kids’ bento box. Based on the popular Japanese bento boxes, Bentgo lets you pack a balanced buffet of good foods in small, healthy portions. Bentgo has five individual compartments: one that holds half a sandwich, and four others for nuts, fruit, veggies, yogurt, dip . . . whatever your child likes best—or whatever you’d like your child to try. The lid forms a seal over the individual compartments, so foods never touch, which is perfect for the pickiest little eaters. 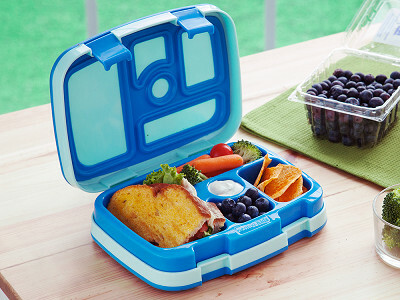 Another great thing is this lunch box eliminates the packing and cleaning that typically goes with kids’ lunches. You don’t need separate little containers (which some kids can’t even open) or plastic baggies to offer an appetizing variety of foods. There’s only one removable, dishwasher-safe tray. Bentgo is BPA-free and eco-friendly, too. Stackable, durable, and cute, it’s no wonder this kids’ bento box is approved by kids and parents alike. Hello everyone! I'm proud to introduce Bentgo Kids durable and leak-proof lunch boxes to The Grommet. I'd be happy to answer any questions you have! @Lisa Hi Lisa! It is 8.5” x 6.5” x 2” and weighs 1 lb 4 oz. 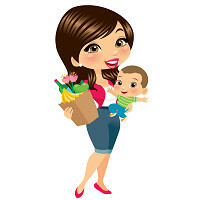 The size makes it very easy to carry and transport - my son takes it to daycare everyday and loves it. @Gail Gail, it fits easily in a lunch box/bag? @Lisa Yes! Though just make sure to check the dimensions of your lunch bag, next to the dimensions of the Bentgo. Lunch bags come in all different sizes so I just want to make sure you have one that works well. Is there anything to keep it cold or does in need to be refrigerated? @Gail Do those ice packs fit in the the box? If not are you looking at one that can hold an ice pack for future models? @Gail: you should make the compartment tray to be able to be a cold pack. Pop in the freezer then into the box the next day for lunch to keep things cold. Gail, I'm with Brett - do your ice packs fit into this box? I rally love this idea, but with the things I pack I need to keep them cold! This looks really cool. Is there an adult size available? @Gail Great! Thanks! I took a peek at your website. I REALLY like the leak proof aspect of the kids version. I HATE it when my foods touch (yes, i'm one of those people). The kids version seems like a great way to carry a variety of snacks. Does it keep hot things hot? @Kathy Haha don't worry, I am one of those people too :) I think it comes with my need to be massively organized! The removable tray is microwave safe and yes can retain heat (but it is made of plastic -BPA free!- so as you can imagine, doesn't hold the heat all day). @Gail Do you have any options with silicone tray instead of plastic? @Olivia Ahh no silicone tray option as of right now, but this is a great suggestion / idea. Thank you Olivia! (This comment board is an awesome way to gather user thoughts - I love it). Though speaking of tray options, just so everyone knows, the tray can be popped out and washed independently of the box (cleanliness and ease is really important to us). That means you can swap out the tray colors and mix and match box colors. @Gail I'm looking everywhere for a glass version of the tray, with all compartments leakproof from one another like yours. Many of us Asians want to bring hot lunches (so we put heat pad under the lunch box in a lunch bag), and a glass version will make sure it doesn't have any safety concern -- I've heard that BPA-free plastics are not necessarily safe when heated). Really hope a glass version will be available sometime soon. @Isabella Isabella this is a great suggestion! It may not work for our Bentgo Kids version for safety reasons, but perhaps we can explore this idea for our original version which is made for all ages. Our trays are approved and safe for microwaves, however for other, more direct forms for heat, those aren't approved. Thank you Isabella - this is great insight! Are you going to make an adult size? It would be great for lunch at work for same reason as kids. @Joy Hi Joy! We do have our original version which is made for all ages, however that style isn't part of today's sale. Crossing our fingers that The Grommet team brings us back here to showcase that line as well! do you have pink for girls? @Suriani Hello Suriani! We don't have a pink version, but the purple one comes close. The rubber coated lining is a dark purple but the rest of the lunchbox is a light, pastel purple. @Robert Ahh yes, I hear you! My son is two and I fit the smaller juice boxes in the large compartment of the Bentgo tray. However I know that size juice box probably won't work well for older children. We'll definitely take this into consideration if (hopefully 'when'!) we make a new version down the line. We do have a Bentgo cup as an external accessory (though it isn't part of today's Grommet sale). This is great feedback, thank you Robert and Joyce! So if the ice pack does not fit in the box - I noticed that another shopping site carries a Bentgo Insulated Bag. Will the kids lunch box fit into this bag so I can put the ice packs in with it? Great to know. I don't care if it doesn't sit flat (because it is actually for me!) as a gastric bypass patient of 10 years (and I have kept 250 pounds off) this is a great size. Now what I would like to know is will the cup or a water bottle fit in there also? @Pat Wow congratulations Pat! That's really an amazing accomplishment and I know it takes a lot of hard work to stay healthy. Eating right such a big component of that I'm sure. These Bentgo lunchboxes are great because they really encourage portion control.... To answer your question, YES the Bentgo Kids box sits on the bottom of the lunchbox and then you can place a water bottle on top of that. Keep up the great work! I would love a version that has a space for a small water bottle or juice box, and that keeps things cold with a removable ice insert. Nice product. @Rachel THANK YOU RACHEL! Your kind words really mean a lot. I have put a small juice box in the largest compartment of this Bentgo Kids box, but my son is two and doesn't drink larger juice boxes yet so it works perfectly for his age. It probably won't work as well for older kids who require larger drink containers. These are great suggestions and we'll definitely try to work in space for the drinks as well as ice inserts inside the box (and not just external ice packs), down the line. Thank you! @Olivia Thanks so much Olivia :) We do have an 'adult' version, which is our original Bentgo design that is made for all ages. That style of box isn't part of today's Grommet sale but I'll definitely bring that up with the Grommet team, and hopefully you'll see us back here with that full line as well! Hi Gail, Do all of the boxes say Bentgo Kids on the container? @Jennifer Hello Jennifer! Yes our Bentgo Kids style all have that label. We think it's cute and stylish, hopefully you do too...??! Cool, just a suggestion, make it cool...add ice pack to either side, if you had two one side could be colder than the other. @Krista this is great - really awesome suggestions. We know keeping this cool is important to our users so when we work on a new version down the line this will for sure be a top priority. I love your specifics and the attention to detail. Thank you! Do You sell the inserts separately so that if one is in the dishwasher and we need to use it I can just use the other insert? Will this come in adults size any time soon? Thank you. @Ruby Hello Ruby! We actually do make a Bentgo lunchbox for all ages (it's our original Bentgo version). However for this Grommet sale we just have our Bentgo Kids version available. Crossing our fingers that The Grommet brings us back to showcase our entire line, which includes the all ages Bentgo as well as all of the accessories! I'd love to see an adult version of this. Any plans for that? I see you already answered this! great product. the only thing I would change is the logo - kids. It keeps older kids from wanting it. @Linda Ahhh Linda thank you! Feedback and thoughts are always great. Right now all of our boxes have the logo printed on it, but yes will definitely keep this in mind moving forward! I don't see a leak-proof adult version on your website? @nancy Hi Nancy! Our Bentgo Kids version, with it's rubber sealing, is leak-proof. The Bentgo original version doesn't have the same rubber sealing so we don't claim it is 100% leakproof. However we do have sauce cups as external accessories which can store liquids very nicely :) And these sauce cups fit nicely into Bentgos. Hi Charles, thanks for the comment. I'm sure you could find various spin offs of our products on site in big box stores, but in purchasing Bentgo from The Grommet, you are supporting an independent Maker. Hard to beat that! @Mike @Charles - thank you Mike for the vote of support! I second that :) Hopefully that helps in your decision Charles! Is there a "chill bag" to accompany this obviously great item? Hi Terry, not at the moment, but as Gail has said above, they might be looking into a way to incorporating ice packs or something of the like. Do you have plans to make an adult version? My wife could really use one. Hi John and everyone else inquiring on the adult version, we are currently looking into the feasibility of bringing it on site. Stay tuned! @Mike am I correct that the adult version is not leakproof? Yes you are, Nancy. While it is very secure, because of the stacking, a leakproof experience cannot be guaranteed. @nancy Hello! Great question and one we want to make sure everyone is clear on, so thanks for asking Nancy... The Bentgo Kids lunchbox (the version that is sold here on The Grommet) has leak proof technology to keep meals mess free. So YES, leakproof :) Our Bentgo original version (which again isn't part of today's launch) is not leak proof but external sauce cups can be purchased to be placed inside the boxes, allowing for easy,mess-free transportation of the sauces. If you're looking for a leak-proof lunchbox, those are the only ones sold here on The Grommet so we have you covered! I've a suggestion with regard to keeping the contents cold with the use of an external freezer pack. Could the structure of your product be modified to provide hollow areas within it's structure(s) which would accommodate the internal storage of refrigerant gel? @Lindsey Lindsey this is a great suggestion! Awesome. I will make sure to bring up this recommendation in our next design meeting. Hopefully more great products will come from this. Thank you! Is there a place to add an ice pack underneath the tray? @Karina Hi Karina! Unfortunately there's not a place to insert an ice pack into the Bentgo. However I often put an external ice pack alongside the Bentgo when transporting it, and it works fine in keeping this cool. I hope this helps! Portion control is HUGE right now, why not make them for "big kids" (i.e. Adults)? I was going to buy one for myself, but they say Kids on the lids. @Nicole Totally agree Nicole! Paying attention to portions has made a big difference in the way that I eat. So sorry to hear the Bentgo Kids logo doesn't sit well with you. We do have a Bentgo original version that is created for all ages, though that particular style isn't a part of today's Grommet sale lineup. Hopefully we will be back with that version in the near future! Looking for adult version - I hope soon - thanks! @Roxanne Thanks Roxanne :) We hope to be back on The Grommet with our Bentgo original version lunchboxes and accessories as well.... Stay tuned! Still looking! Your product projects an amazing idea of food prep for on the go meals. Hi Saundria, they really are perfect on the go! As you'll see throughout the thread, there is currently an adult version being sold and we are working to get it on site. Stay tuned! @Saundria Hello Saundria! Shopping sounds like a fun way to spend your retirement :) Thanks so much for the compliments - it means a lot to our small company. The Bentgo Kids version is perfect for the young ones - it's portion controlled for the amount of food that children typically eat. We do have an 'adult' version, which is our original Bentgo lunchbox. It's not sold during this Grommet sale, though hopefully we will be back with that option here in the future. Until then, hopefully you can make use of the Bentgo Kids style - its a huge help for any on-the-go meal! Love this idea and would have bought it immediately if the compartment tray was also a cold pack. I need to be able to pop in the freezer then into the box the next day for lunch to keep things cold. Will keep my eye out to see if that is forthcoming (fingers crossed)! @Mandy Thanks Mandy for your feedback! I hear you. I keep my son's in the refrigerator and then take it out in the morning and throw an ice pack alongside it to keep it cool for lunchtime. It works perfectly that way in case you don't have the patience to wait for a new version :) We'll definitely take this suggestion to heart though - it will be discussed at the next design meeting! Healthy eating is much more fun when it’s presented in a Bentgo kids’ bento box. Based on the popular Japanese bento boxes, Bentgo lets you pack a balanced buffet of good foods in small, healthy portions. Bentgo has five individual compartments: one that holds half a sandwich, and four others for nuts, fruit, veggies, yogurt, dip . . . whatever your child likes best—or whatever you’d like your child to try. The lid forms a seal over the individual compartments, so foods never touch, which is perfect for the pickiest little eaters. 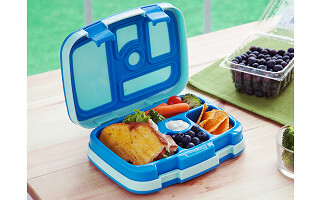 Another great thing is this lunch box eliminates the packing and cleaning that typically goes with kids’ lunches. You don’t need separate little containers (which some kids can’t even open) or plastic baggies to offer an appetizing variety of foods. There’s only one removable, dishwasher-safe tray.